Hot water cornbread is disappearing. Despite Nashville being hailed as a Mecca of meat and threes by the Southern Foodways Alliance’s John T. Edge, those remaining meat and threes that have hot water cornbread are fewer and further between. I lived in Nashville for 4 years, and became well acquainted with many of them. I came to know the neighborhoods, the smells and the cooks working the line. Fried chicken, greens, fried corn and mac n’ cheese with hot water cornbread at the Kleer-Vu Lunchroom, Murfreesboro, TN. I became enamored of hot water cornbread at Murfreesboro, TN’s Kleer-Vu Lunchroom on a trip down to Manchester for my annual Bonnaroo outing back in 2006 (Radiohead!). While I loved the diversity of restaurants in Minneapolis, where I lived and worked at the time, anywhere hailed as “Southern” or “Soul Food” fell wide of the mark. Real wide. And so, I did some digging on local meat and threes, to eat my history as a displaced Southerner. At Kleer-Vu, I had an epiphany. 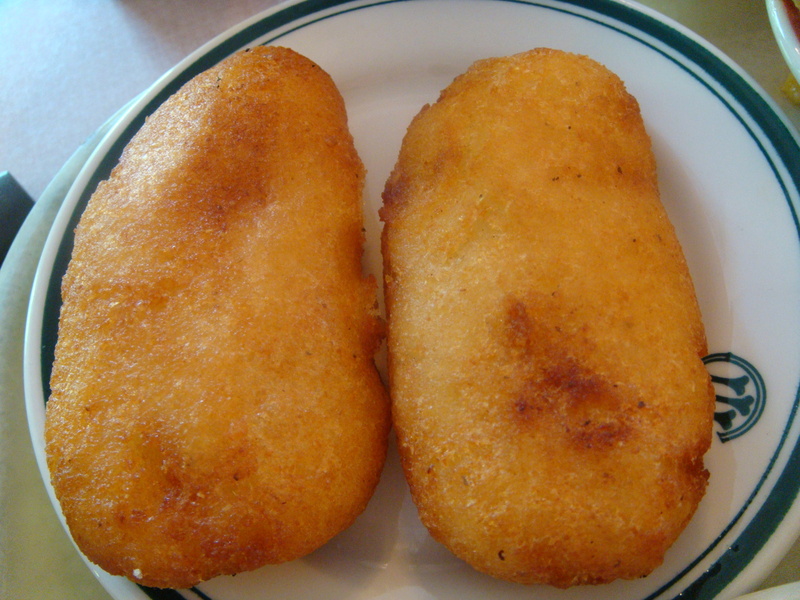 Basically, the cornmeal is mixed with boiling water to form a dough, then fried. The result, when made properly, is light, crispy and slightly chewy at the same time, with a fluffy interior. It’s great dipped in pinto or crowder peas, used to soak up potlikker from your greens or I’d even imagine dipped in a glass of some ice cold Cruze Dairy buttermilk. When I transitioned down to Nashville in 2007, I made a regular habit of hitting up meat and threes on my day off. Lots of older folks seemed to know about it, but the kids didn’t. My friend Stanette hailed from Alabama, and said regularly that she hated hot water cornbread as it was lazy folks’ cornbread. “It’s what my momma made when she didn’t feel like makin’ it right.” Stanette was from Tuscaloosa. But I disagreed then, and I still do now. That it became harder to find just made it cooler in my mind. I did some digging around, asking folks I knew about it. Joe Dabney, who has spent a significant chunk of time researching and publishing on foodways from Appalachia and the SC Lowcountry said “never heard of it.” and directed me to the National Cornbread Festival in South Pittsburgh, TN. Put some good quality white cornmeal (say, 1 or 2 cups) in a bowl, add about a tsp. of kosher salt and about a Tbsp. of bacon grease. and it worked well for them and for their English visitors. Hope it works for you. So I’m not an anthropologist, but I seem to feel as though hot water cornbread is more or less local to middle / western TN, Northern AL, eastern MS and perhaps AR and maybe central – southern KY. I guess this would make sense. In and around Nashville, the three places I’ve found to still have it are of course the Kleer-Vu Lunchroom, The Sands (or The Silver Sands if you’re old school) and Southern Bred. I’m now back in my adopted home of Charleston, SC. We have some really killer meat and threes here, but no one has ever seen or heard of hot water cornbread. If you should find yourself in the neighborhood of Murfreesboro, do yourself a favor and make that trip over to Kleer-Vu, just a couple blocks off the old town square, and park under that great big tree in the gravel parking lot. Check out the articles on Alex Haley hanging on the wall as you move through the line. Get some chicken and some fried corn, and say “Hey” to Miss Anita at the register. It’s a special place. You see, they have hot water cornbread. There’s that whole juxtaposition of crispy / chewy again. I’m from Louisiana. North Louisiana to be more specific. I know most people who aren’t from Louisiana don’t realize the culture in North Louisiana until recently was a VERY different culture from that of South Louisiana. When I was kid I had no idea what a crawfish was, much less that you could eat it! I didn’t try my first crawfish until I was 18, after I had moved to South Louisiana. In fact, neither my mother nor any of her siblings to this day know how to properly cook Cajun foods, but they can cook the best pecan pie, purple hull peas, peach cobbler, pralines, stewed potatoe soup, cornbread dressing, and hot water bread you’ve ever had in your life! You see, my grandmother was Native American and the food her children and grandchildren grew up on came from her culture combined with local North Louisiana favorites! She cooked 2 types of bread from cornmeal: Hot Water Bread (I don’t know where the “corn” part went, but we never used it…maybe like the French calling french toast just “toast”) and Pone Bread. 1. Hot Water Bread was made with cornmeal and hot water only. We didn’t add salt or any other seasoning. Again, very different from our South Louisiana chefs. It was then shaped into football shapes and pan fried in vegetable oil. It was served at dinner much like a dinner roll would be. My favorite way to eat it was and still is with purple hull peas to soak up the juice/gravy the peas made (We didn’t eat purple hull peas or beef stew over rice like many do in South Louisiana…rice was grown simultaneously with crawfish farms in South Louisiana, so we just didn’t use it as much as those in South Louisiana did. We made cornbread dressing instead of rice dressing at Thanksgiving and Christmas, too!) My dad preferred to crumble up his Hot Water Bread in a glass of buttermilk and eat it with a spoon. 2. Pone Bread was made the exact same way, but was shaped into very thin (pancake thin) circle shapes before frying in bacon grease. Pone bread was served with breakfast and we would eat it with butter and honey more like one would eat pancakes. To this day, none of my friends in South Louisiana know what I am talking about when I try to explain hot water bread. I usually explain it as flat football shaped hushpuppies with no seasoning and they seem pretty unimpressed with that, since seasoning is what Cajun food is all about! 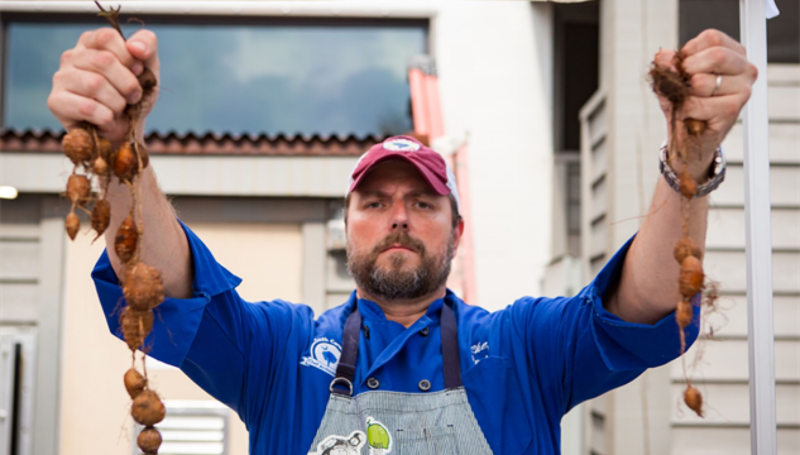 While in the last decade North Louisiana has adopted many of South Louisiana’s recipes, the same cannot be said for Louisiana’s more southern chefs. So it’s nice to see that others appreciate a food that I happen to think is delicious! Next PostNext Validation – The Review by the Charleston Post and Courier.